Looking for a vintage engagement ring for your bride-to-be? 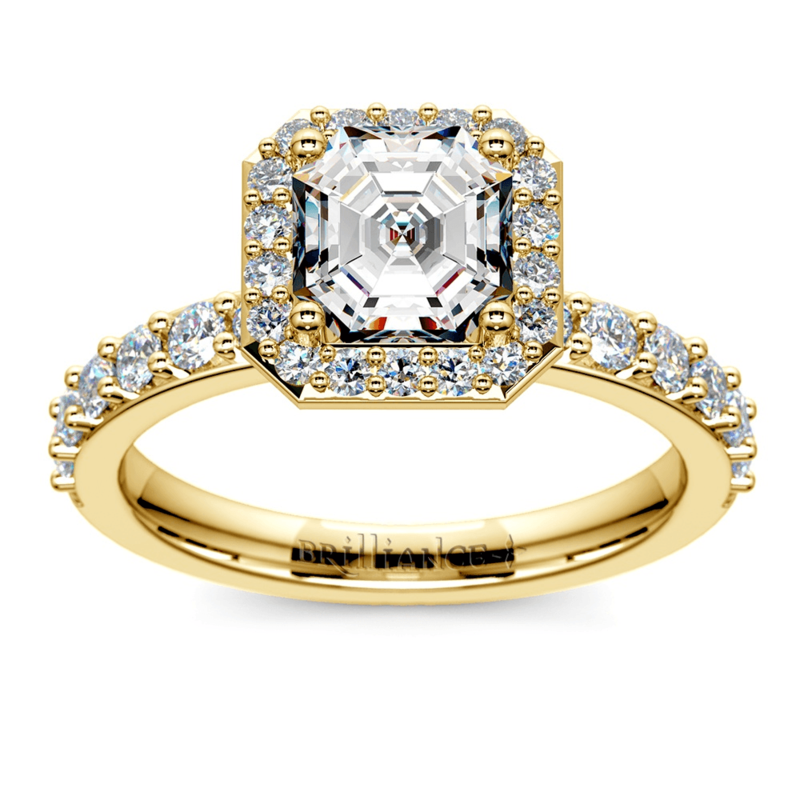 Already have a loose Asscher diamond just waiting for a setting? Many brides are taking inspiration from the past when choosing their engagement rings, which is why Asscher engagement rings in vintage settings are becoming increasingly popular. If you’re interested in antique style, keep these tips in mind when selecting your engagement ring. Asscher engagement rings gained popularity throughout the early 20th century, and were most in-demand in the 1920s. As such, most vintage settings are inspired by one of two different style eras: the Art Deco or the Edwardian era. Before you choose a vintage setting, it’s important to learn about each of these eras to determine which one best fits your personal style. Rings that are inspired by the 1920s will have an Art Deco feel, with sharp, symmetrical lines and an intricate band featuring geometric shapes and designs. 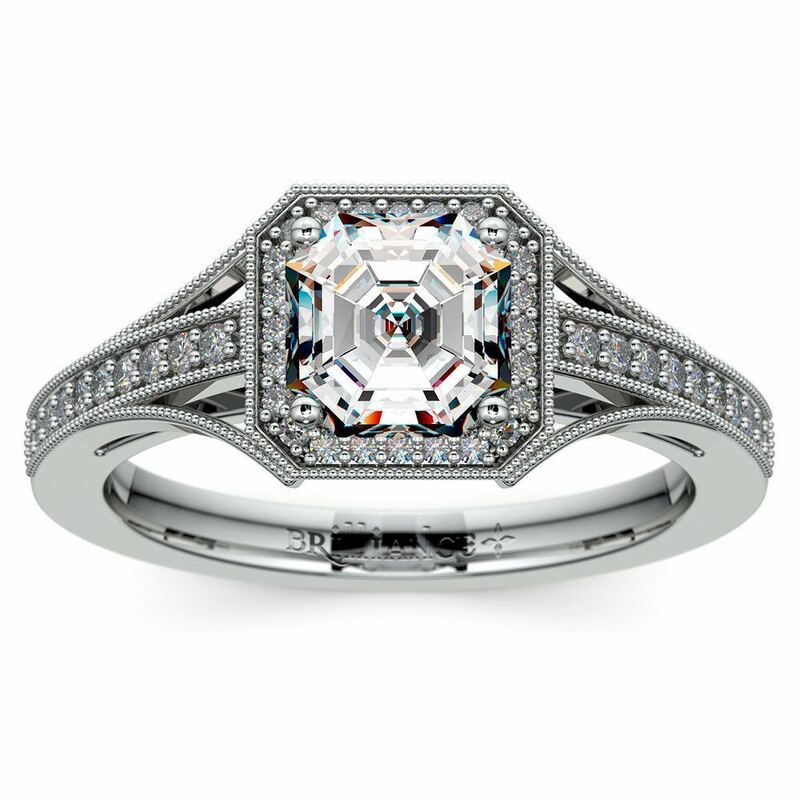 The architectural aesthetic of Art Deco matches beautifully with an Asscher diamond’s clean cut and “hall of mirrors” effect, which is why it was so popular with brides of that time period — and with brides today. If you prefer a less flashy style, Edwardian-inspired engagement rings offer a softer vintage look. 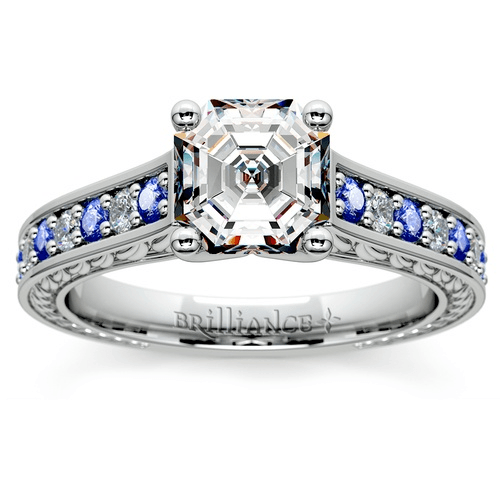 These rings are placed in more delicate settings that draw attention to the center stone. The designs are often inspired by nature, such as flowers or curving vines. There’s a quiet elegance to Edwardian-inspired rings that speaks to many of today’s brides. When you look at authentic vintage rings from either of these times, you may notice that many women wore engagement rings with both diamonds and gemstones. 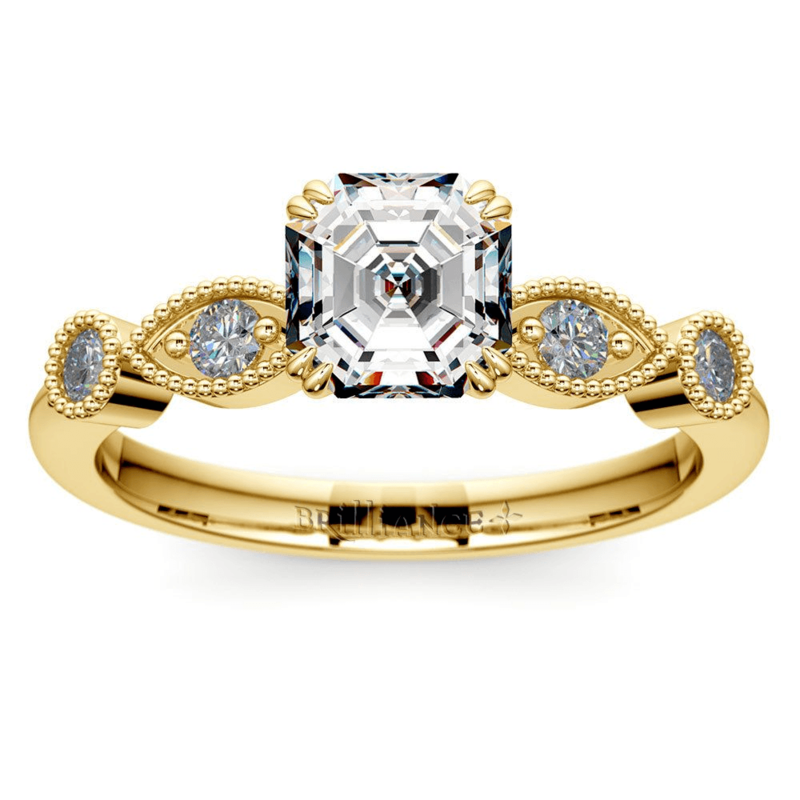 Don’t be afraid to recreate this look with your vintage-inspired engagement ring. The Asscher diamond shape looks great with sapphires, emeralds, and rubies, so consider using these stones as side stones — or even as the center stone! This will help you achieve a truly unique look that is reminiscent of the early 20th century. If you choose to go with a traditional diamond for your center stone, then you need to look at the 4 Cs. While cut and clarity are always important, be aware that it is much easier to see color in an Asscher cut diamond than it is in other diamond shapes. Because of this, you should pay close attention to each diamond’s color grade when shopping and budgeting for your Asscher diamond engagement ring. Which color grade should you choose? It depends on the setting. White gold or platinum will make any color in your diamond more obvious. But many vintage settings are yellow or rose gold, which tend to camouflage slight hints of color in diamonds. If you’re choosing a yellow or rose gold setting, you don’t have to spend as much money buying a diamond with a higher color grade because an I or J color grade may look very similar to a D grade in these warm-toned metals. The other big ‘C’ to consider is carat size. Asscher-cut diamonds have small surface areas compared to other shapes, which may make these diamonds appear smaller than others of the same carat weight. To make up for this, look for vintage-inspired settings that maximize the size of the ring. 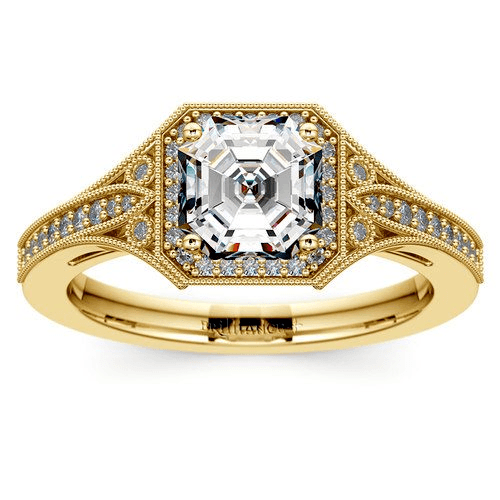 For example, an Art Deco-inspired band that features a halo setting around the center stone and small diamonds down the band (like the one pictured above) will add extra sparkle and make the center stone appear larger. If you know you want a vintage-inspired Asscher cut ring but aren’t sure exactly what setting you want, get inspired by some of your favorite celebrities. Do you love the thin band and halo setting of Jessica Alba’s Asscher cut engagement ring? 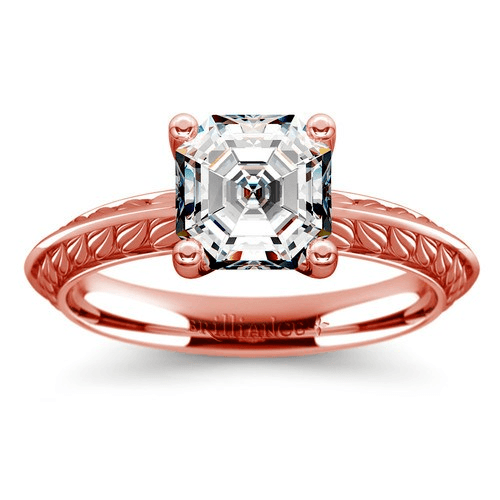 Or do you prefer Kate Hudson’s engagement ring from first husband Chris Robinson, which featured a Asscher-cut gemstone in an Art Deco setting? Looking at pictures of celebrities’ Asscher engagement rings will help you figure out which type of setting you like best. There are countless vintage-inspired Asscher engagement rings that you can buy for your bride-to-be today, so follow these tips and you shouldn’t have any trouble finding the right one for you!